There are a number of references to Grendel in Marathon Infinity. Rob Boggs <rboggsnhl@earthlink.com> writes concerning the level name "Son of Grendel". Son of Grendel: Grendel was the monster that was nigh-invulnerable in the story of Beowulf, are WE the son of Grendel in this instance? or are we Beowulf, taking down the nearly invincible monster. The Net level Son of Grendel may be a reference to the Dark Horse comic entitled Grendel. There are several references in Marathon Infinity, mostly made by Tfear, if memory serves, to some kind of command location or structure known as "Grn'dl Prime". It's worth mentioning that in Matt Wagner's comic book mythology _Grendel_, one part of the future has the earth under the dominion of a dictator known as "Grendel-Prime". Coincidence? Noah goes on to point out that in the comic version of Grendel, Grendel-Prime is eventually overthrown by his son. In the book _The_Legacy_of_Heorot_, by Larry Niven, a colony ship is sent from Earth to (of all places!) Tau Ceti! There happens to be a rather nasty type of creature on the island that serves as the base colony. This creature is know as a _grendel_. The only security officer in the colony is, at first, the only one who knows about this creature until it devastates the colony. Eventually all of them are killed, resulting in the creation of about a thousand more because of a disrupted eco-system. So you've got your veteran security officer, your hordes of destructive alien life forms. Intriguing, eh?" Incidently "The Legacy of Heorot" is by Larry Niven, Jerry Pournelle, and Steven Barnes. The title comes from Beowulf. Remember "Heorot Hall"? There is a sequel called "Beowulf's Children". One of the driving themes behind the *Grendel* series is that "Grendel," whatever it is, moves from life to life. The first contemporary incarnation of this (according to Mr. Wagner's mythos), was a man by the name of Hunter Rose; he was a criminal, and died by the hands of an ancient adversary, Argent. Before he died, he adopted a daughter, who in turn adopted a daughter herself. This daughter, Christine Spar, was the next incarnation of Grendel, this time out for revenge for her son's death--but eventually Grendel drowned her. Next, her lover, Brian Li Sung, became imbued with Grendel, and the policeman who killed him fell to the same fate. Later, Grendel seemed to be more a psychological phenomenon, with little personal contact necessary. I know all this comic book mythos might seem silly, but there is a point, here, and that is: For Matt Wagner, it seems that "Grendel" is not a metaphysical entity, but rather an infectious state of mind that proliferates wildly, usually ending in the death of the "host," for lack of a better term. From here, I want to tie together several seemingly disparate threads. 1) If Rampancy is indeed akin to a cancerous infection of the mind, might it not be plausible to characterize it as eventually dangerous to the "organism" housing that cancer, yet enhancing it in some way (unlike physical cancer)? Note that in MW's mythos, as well as Marathon's, Rampant (or "Grendel-ized") AIs/persons become more powerful, independent, and richer because of this condition? 2) That Grendel can move from person to person--this seems to be the case with Rampancy. In M1, we see Tycho infected with it, in M2, we discover that Leela has also been affected (the final screen), and finally, in MI, the S'pht go Rampant, and perhaps so do we. In this vein, I want to stress that both "Grendel" and "Rampancy" refer to states of being, not entities invading one. Note that cancerous cells were normal to begin with, and it is *their* mutation that makes them cancerous--it is not an infection or invasion. 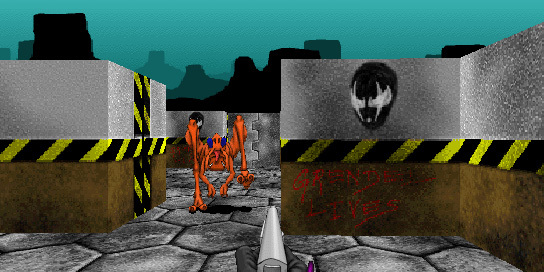 The following are a set of screenshots from an early version of Marathon. The story goes that you are sent to investigate the disappearance of colonists living on a hollowed-out asteroid near the planet Pluto. Unfortunately when you arrive you find that all the colonists have been killed by alien monsters and you're next on the menu. Note the wall writing and Matt Wagner's "Grendel" image. Avi asks could this be gibberish for "grendel's ---"? ...if you look in the shapes file of Infinity there is an item called Grendel. He's this little black monster thingie, and there is also a name for that octopus thing you were talking about. Vivat Grendel. Matt Wagner's Grendel mythology has already been mentioned, but at least one specific aspect of it was not -- in the "Grendel: War Child" series, Grendel-Prime, the main protagonist, is in fact a _cyborg_. I thought it was worth mentioning. This same character appears in the the Batman/Grendel team-up (also by Wagner), but is geared more towards being the villian. In battle, the Paladin had no equal. He was a cyborg, built by Orion Assante, the first Grendel-Khan, ruler of Earth, for one purpose and one purpose alone: to see that Orion's only son, Jupiter, would safely reach maturity and claim the throne that his father would leave. The machine that was the Paladin gave him speed and strength, made him an unparalleled warrior. THe man of him gave the rest, the heart and soul and mind of a Grendel. Ultimately disciplined, unwaveringly loyal, absolutely focused. He was the perfect soldier. Here's a walkthrough and some screenshots from the Marathon Beta SF Jan'94. Thanks to Raul Bonilla <lassonde@hotmail.com>, Craig Fay <DurandalM3@aol.com>, and Robert Zimmermann <robzim@gmx.net>.